The profound love a parent has for her newborn child immediately and inherently carries with it many fears - that you won't be a perfect parent, or maybe even a good enough parent, or quite possibly even fail completely as a parent. There are a million ways you can and no doubt will disappoint your child, or choose poorly, or not rise to the occasion when a situation calls for wisdom, maturity, know-how, or transcendence. At some time you will be and do all of these things, and probably it will be okay. But deep in the heart of every parent also lurks a truly profound terror, directly proportional to the immensity of your love, that something terrible could happen to the fragile and tiny being entrusted to your care. We hope and pray that we will never need to know who we will be called to be in this moment. 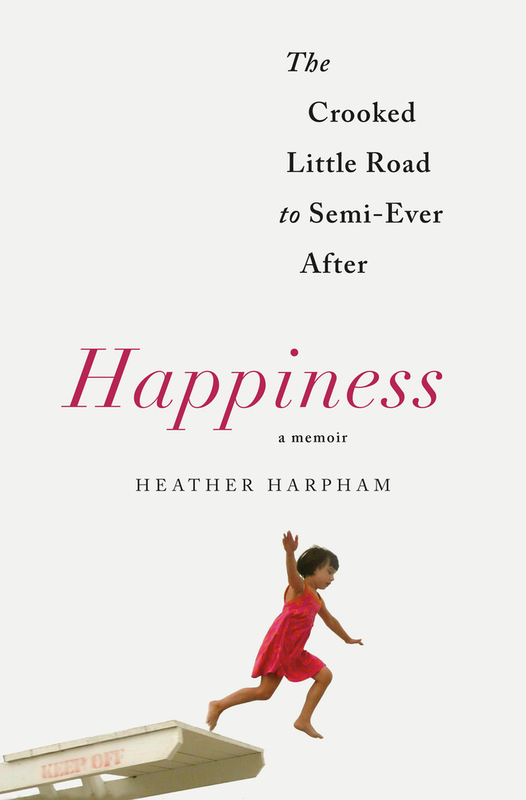 Heather Harpham, author of Happiness: The Crooked Little Road to Semi-Ever After (Henry Holt, 2017), was called to this moment. She was not ready. She never expected it, nor did she even expect to become a parent when she discovered she was pregnant. Her partner, the writer Brian Morton, was reluctant to start a family. Realizing she was on her own, Heather left New York City and returned to California, piecing together a supportive network of family and friends to welcome her baby. Not a perfect nuclear family perhaps, but beautiful in its own way, and into this loving and stable world baby Gracie was born. Almost immediately, however, it became clear something was desperately wrong. Little Gracie had a rare and life-threatening blood disorder which would send her to countless doctors and hospital visits, and eventually require a bone marrow transplant. Happiness tells the story not only of Gracie's illness and her parents' harrowing quest for a cure, but also of one family's non-traditional path to formation. "This was how we told each other our stories, in the margins, in the kitchen, over Styrofoam cups, while washing our hands at the decontamination trough, at the snack machine, without ceremony. Without self-dramatization. Without even the faintest nod to the horror of what was described because the assumption was everyone had horror." Gracie is one of the lucky ones, and it must be noted that she had things going in her favor that many other children might not: access to excellent doctors, health insurance, family who had the opportunity and flexibility to travel with her to find the best care, the connections that helped her find those opportunities to start with, and a community that rallied to raise funds to make her treatment possible. To her credit, Harpham is upfront about and acknowledges these. In a year in which America's health care access is being systematically dismantled for so many, these are even more important to note, for it must be true that many children did not, and many more will not, be graced with the same quality care. But even with every advantage, there is still no guarantee of a good outcome. This is what kept me riveted, and which pierced my heart and stuck with me well beyond the end of the story. For this is every parents' deepest fear and frankest reality: sometimes no matter what you do, and what resources you have, there are things completely beyond your control. The universe will humble us, again and again. Happiness left me considering how our deepest challenges shape us and make us who we are, and who will we be called to be, when faced with the worst? I received a complimentary copy of Happiness from the publisher. As soon as Trump started signing things this week to weaken the Affordable Care Act, I noticed moms coming together on Twitter, giving each other support and advice about how to help their sick child. One woman's son is a Type 1 diabetic and keeps ending up in the hospital because they can't afford his insulin (and does the government not know how much more expensive hospitalization is by comparison?). She shared a picture of him. I think this memoir would be hard for me to read now. So heartbreaking, and so shortsighted from a policy point of view. Healthcare so fundamental to everything else.